Excerpt: This book is about the early history of specialised jousting equipment. 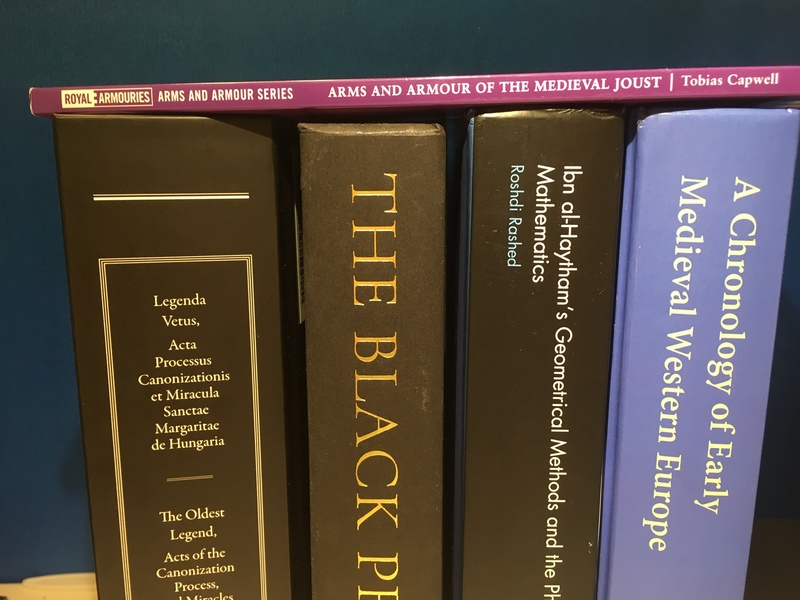 It looks at how and why the joust arose, charts its development throughout the Middle Ages, traces the first appearances of dedicated weapons and armour, and ends with the perfection of complete jousting armour during the fifteenth century. Although this is a story of weapons and warriors, it is not one of war and destruction, but of glittering festivals and the celebration of chivalry. To joust with another person was to do them honour, showing respect and trust. It should not be at all surprising that jousts were often held at weddings, peace treatises and other important diplomatic occasions. Specialised jousting equipment made this ‘cordial violence’ possible, facilitating a hugely important aspect of political, cultural and courtly life. This is the story of the armour of peace. Excerpt: I walk into Canterbury Cathedral, a place of pilgrimage, whose soaring Gothic architecture surrounds the remains of its martyred twelfth-century archbishop. I am searching for a magnificent tomb, close to the shrine of Thomas à Becket. However, it is not a medieval prelate I am seeking but a warrior prince, one of the greatest war leaders England was ever to know. Born at Woodstock in 1330 and christened Edward after his father, his life was spent in the pursuit of a chivalric ideal, whether in battles or jousting at tournaments, or courting the affections of the beautiful Joan of Kent, who would become his wife. Excerpt: Two documents fill the largest part of this volume: the oldest Vita of Saint Margaret of Hungary, written between 1272 and 1275 and first edited by Kornel Bole, and the acts of the 110 testimonies of the second papal investigation concerning her sainthood, recorded between 23 July and 20 October 1276 and edited by Vilmos Fraknoi. Besides their common subject, namely the events of Margaret’s saintly life, they constitute together the most valuable set of documents pertaining to religious beliefs in thirteenth-century Hungary. Publisher’s Overview: A Chronology of Early Medieval Western Europe uses a wide range of both primary and secondary sources to chart the history of Britain and Western Europe, with reference to the Celtic world, Scandinavia, the Mediterranean and North America. Extending from the middle of the fifth century to the Norman Conquest in 1066, the book is divided into five chronologies that present the day-to-day developments of events such as the fall of Rome, the Viking invasion and the military campaigns of King Alfred, as well as charting the cult of the mysterious ‘King Arthur’. Timothy Venning’s accompanying introduction also provides a discussion of the different types of sources used and the development of sources and records throughout these centuries. Excerpt: Every science and every study has a purpose, and that purpose is the peak to which one ascends, and to which aspire the spirits of those seek after it zealously, with the aim of reaching it and mastering it. The mathematical sciences are founded on proofs; the ends they seek to attain are determination of unknowns, in the parts of the mathematical sciences, and to establish proofs that demonstrate the truth of their results ~ from On Analysis and Synthesis.